SHENYANG - After a six-month negotiation, US fast food giant KFC on Thursday signed its first collective contract on the Chinese mainland with its employees in Shenyang, capital of Liaoning province. Workers will also have an annual pay raise of 5 percent or more, the contract stipulates. With a contract period of 18 months, the trade union will launch a new round of collective negotiations with the company in 2011. 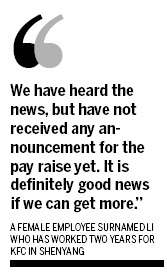 "We have heard the news, but have not received any announcement for the pay raise yet. It is definitely good news if we can get more," said a female employee surnamed Li who has been working two years for KFC in Shenyang. It is still not clear if the part-time workers are included in the collective contract. Last December, the trade union of KFC in Shenyang invited the company for collective contract negotiation. But after three months, the parties could not reach an agreement. The Shenyang municipal trade union stepped in in late March, to carry out negotiations. Officials from the Yum! China Division, headquartered in Shanghai, said on Thursday afternoon they are "pleased" to see such a collective contract in Shenyang, without offering further comments. Statistics from All China Federation of Trade Unions show that at the end of 2009, there were 512,000 collective wage contracts for about 61.77 million workers, and the federation has been actively promoting such practices across the country. KFC's collective contract, with the salary increase, came amid rising tensions between the country's laborers and employers. On Thursday, Toyota Motor Corp, the latest automaker hit by a strike at a China parts supplier, said its car assembly operations were not affected by a short-lived dispute. Niu Yu, spokesman for Toyota China in Beijing, said the strike at affiliate Toyota Gosei Co Ltd's plant in Tianjin, had ended. Toyota Gosei spokesman Tomotaka Ito said the strike at the plant, Tianjin Star Light Rubber and Plastic Co, began on Tuesday and ended on Wednesday after the company agreed to review the pay structure for its 800 workers. Production resumed on Wednesday afternoon, despite a national holiday, to make up for lost time, said Ito, who would give no further details. The strike was the first reported for Toyota following strikes at several China suppliers of Honda Motor Co that forced that Japanese automaker to suspend car assembly intermittently in the past month due to a lack of parts. The recent tensions between employees and employers have raised concern from the country's top leadership. "Migrant workers should be cared for, protected and respected, especially the younger generation," Premier Wen Jiabao told a group of migrant workers in Beijing on June 14. A commentary carried by the official People's Daily on Thursday also said the country must lift the incomes of workers to protect stability. China's economic model is facing a "turning point", it said.